Back in October there was a lot of interest around my post on the bespoke service at Whitcomb & Shaftesbury. Their ‘classic bespoke’ service, which involves cutting the suit in London (by a very experienced Row cutter), and then having it largely made in India (in a workshop run by a Row tailor) promised fantastic value at £1350 + VAT for a suit. I’m glad to say that this promise is fulfilled. I have received and worn the suit, and can highly recommend it. It is as good in cut as most other Savile Row suits, and almost as good in make. Whitcomb actually offers two services – one partially made by this Indian workshop (wholly owned by them) and one by a normal Row tailor. I had suits made in both, in order to compare them. I’ll post pictures of the second one later, but there are so few differences that it’s barely worth pointing them out. The chest, lapel and collar are still hand-padded; the buttonholes are finely hand-stitched; every other area of finishing you’d expect from Savile Row bespoke (eg hand-stitching the lining of the waistband) is there. This shouldn’t really be surprising. The same cutter and coatmaker (John McCabe and Bob Bigg) managed the making of both. The only thing you’d be looking for is a difference in execution – and there are some tiny points there. The finishing on the lining isn’t quite as neat – but as you can see on the images above, it’s still good. And the buttonholes have had a machine stitch on the back as a guide, before being finished by hand. This is something most tailors don’t do, but you do occasionally see it used on particularly soft or lightweight cloths. There are also things the Indian workshop can do that you wouldn’t give to most Row tailors. Like the lap seam down the back of the jacket (an idea I shamelessly copied across from my Chittleborough & Morgan suit). And although some of these details weren’t perfect on the examples I saw in the Whitcomb & Shaftesbury workrooms, this lap seam was very nicely done. The cut is lovely and lean, with the suppression of the waist accentuating the sharp style we were going for – single button, more open foreparts, unflapped pockets, plus that lap seam of course. The shoulders are quite soft and natural, although the team can certainly do more roping if requested. 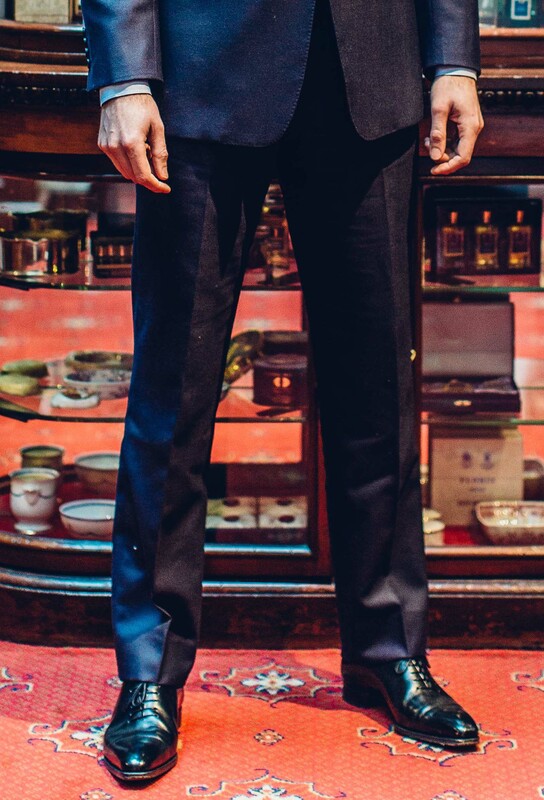 Interestingly, there is also quite a lot of drape to the chest – something I like on my Anderson & Sheppard suits both for their comfort and impression of a bigger upper body. Back in the day, Kilgour French and Stanbury cut with a good bit of drape. That’s where John worked until 2010, and it is still his style. This is a proper Savile Row suit. It is made to the same standards, by people with the same training, with most of it (pattern, cutting, fitting, alteration) still done in London and the heavy-lifting done in India. I can understand why some people don’t want a suit where any of it is made abroad. People even complain when they find out some of the work is being done just off Carnaby Street, rather than in a basement off Savile Row. If those people want that product, they now know exactly what they need to pay for it – £3,050 (the price of the Savile Row Bespoke product) rather than £1,350 (the Classic Bespoke). Location makes no difference to me, but if you want it you can pay £1,700 for the privilege. I’ll reflect more on the overall style of Whitcomb & Shaftesbury, and where it sits relative to other tailors I have tried, when I publish the pictures of the Savile Row Bespoke suit. You can follow the discussion on Whitcomb & Shaftesbury final suit – great value bespoke by entering your email address in the box below. You will then receive an email every time a new comment is added. These will also contain a link to a page where you can stop the alerts, and remove all of your related data from the site. The blue suit……seems to be a popular choice for people in sales professions at the moment. Do you see this as suitable for business, or not so much? This is definitely navy rather than blue… Photography, light, white balance etc can change colours, particularly blues. But yes, I know the trend you mean. It gets made for a lot of weddings. And no, I don’t think it’s appropriate for business. Haha, good to get that one cleared up. I personally think Airforce Blue can look business appropriate in the Summer months, but more for Belgravia than Broadgate perhaps. Simon quick question. Im going to order my first bespoke suit and I know your not supposed to wear it two days in a row and ideally once a week… But then what do you wear for the rest of the week whilst your building your bespoke suit collection to the point you have 5 bespoke suits in rotation? As this can take a year or so? Thanks Simon. So basically I will be sad 4 days a week for a while! If to compare, which make is most value for money? This one, or good value english tailors (for example grahame browne)? If I´m not completely wrong, but the diffrence in price is not that very big. If not Grahame Browne has changed his pricing? How would you compare this to Grahame Browne given the close pricing? Can you confirm the exact fabric for reference if it is navy rather than the mid blue the photographer has managed to make it look like? Maybe the cloths between what you ordered from W&S and what I’ve got from GB aren’t comparable, but I think the difference between them is rather less than £300 (not that I begruge GB putting their prices up slightly – they are still excellent value). Wow, I think this looks fabulous! The shoulder fit looks (to me) the best of your suits on here. 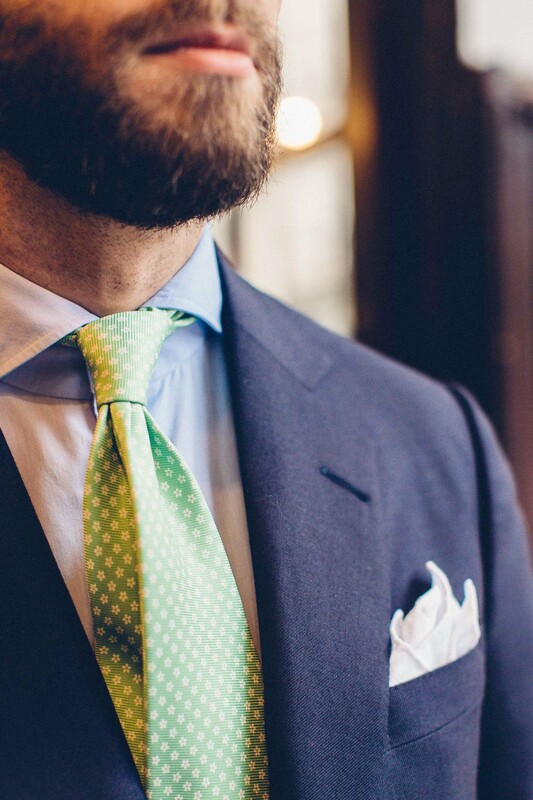 Interesting to see how well a lime tie works too; I wouldn’t have considered that. It looks great. I really like the concept of this – certainly a product with much more soul than your average MTM suit. My worry for a business like W&S is that they’re underselling themselves – the price seems too much of a bargain. After all, people happily walk into Canali and hand over £1500 for factory made MTM suits from a block pattern – I would expect to pay much closer to £2k for a bespoke product like this (which even then is still a cracking deal). There is a tremendous amount of added value in their product – the Savile Row cache, the fact they’re actual tailors and not salesmen – which I don’t think is being communicated in the price. Have you read my post on the margins of bespoke generally? All bespoke has small margins and much higher production costs – money spent on making, rather than selling. I don’t think W&S has any different margins to other bespoke tailors. It’s just that if any bespoke tailor spent as much as designer brands on marketing, advertising, shops etc, they’d be 50% more expensive. Very flattering! And quality is quality, no matter where it’s sourced. This is one thing that has kept me reading your blog – you’re not a snob (in that way). I feel like this product has not been well advertised in the past. My first British bespoke suit was last year, and if I had known about them I might well have talked to W&S. Maybe this blog will help change that. This looks perfect! This is very close to my ideal suit, though I wouldn’t get the lap seam on the back, and I’d get flapped hacking pockets. Seeing how the cutting is the most important part of the suit, they truly understand where costs can and can’t be cut. Looks good, if somewhat ‘softer’ than I imagined given the cutter’s Dege background. Impressive finish, congratulations! When writing about the second suit might you include some further detail about the Cutter/Coatmaker and their views on what makes a good silhouette? Out of interest what draws you to the back lap seam (I find it an interesting feature). Some advice if you would; I’m looking to get a suit (tan cord) garment dyed thinking blue, dark green or dark grey (not to be worn for work). Advice on prospective colour would be welcome! As a footnote Shortlist today have an article on Penhaligon’s free fragrance profiling service. It is not bespoke as with Floris and leads customers to the existing range via a Q and A. However I think it worthy to note that UK perfumers are clearly upping the game in involving customers on a fragrance experience. 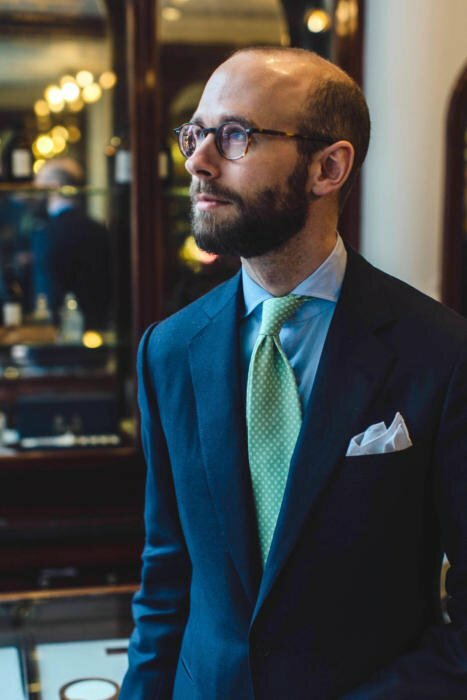 Hi Simon, I know comparing tailors from Italy and England is like comparing apples and pears (style wise), but just from a quality perspective how would you compare Sartoria Vergallo to this W&S offering? As they are roughly in the same price range, I consider both of them for my first bespoke suit. Following your blog, it seems that you were very happy with Vergallo in the past. Thanks and all the best, Michael. I’d say they are both very good. Vergallo doesn’t get enough attention – they remain excellent value. Hi Simon. Thanks for this. Suit looks great and fantastic value, how would you say this would compare to Edward Sexton made to measure which is slightly more expensive. Very compelling offering, thanks for covering. And hands out of pockets do allow a superior view of cut and style.. nice one. Looking at the second photo the silhouette appears to show a wider hip then shoulder and quite large ‘flaps’. Also , It’s great that you still bring your expertise to clothes within a lower price bracket ….sometimes I think we’re losing you to the luxury market a little too much . This is a price bracket that most of your readers could stretch to and so we need more of this from yourself . Just one point on pricing. According to their website the price GBP 1360 is without VAT. Ie price including VAT is GBP 1362. Graham Browne is GBP 1050 INCLUDING VAT, ie the difference in price is GBP 500, not 300 as stated in the comments. Still strikes me as cracking value though. One thing I worry about is whether their business model and pricing is viable in the long term. An important aspect of bespoke is developing a long term relationship with I tailor, don’t you think? Their business has actually been going for a few years – enough to train up that whole Indian workshop – without much exposure at all. So should be here for the long term. hi Simon, very interesting article. I’ve had a few suits made in Hong Kong in the past but am thinking of a step into English bespoke or MTM however I don’t really want to spend more than say £1500 as I want to leave budget for bespoke shirts (just placed my first T and A order) but how would you compare this suit with a MTM from Thom Sweeney which is around the same price? I wear my suit 12 hours a day but tend to have the jacket hung up most of the time, so really it’s trousers that are as important to me. thanks! Thanks Simon. Interesting article. How flexible would you say they are in terms of cut, construction etc? Predominantly a ‘Savile Row’ style or do they stray into Neapolitan construction as well? If the later, have you seen any examples? They’re reasonably flexible, but I wouldn’t ask them to do Neapolitan. I wouldn’t ask any non-Neapolitan tailor to do Neapolitan to be honest. The only tailor I’ve seen do that passably is Cifonelli and even then it’s not quite the same. Thank you. I’m sure you’ve mentioned it elsewhere but which of the Neapolitan tailors are you thinking of in particular? This is slightly out of my budget. I’m looking at getting a first sportsjacket for casual wear made but the justification of £1500 for one despite the longetivity is negative. Any other recommendations? I am unsatisfied considering GB is 850£ but their forte is not in this style of tailoring. 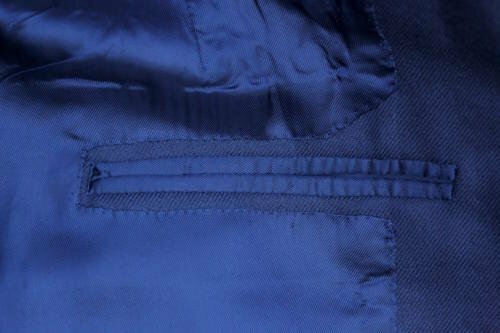 Thanks for the response – What is your view towards a staple in soft suiting in regards to lining and canvassing – Half/quarter lined whilst Thin Half/minimal canvassing? Very nice suit. Whilst on the topic of suits at the cheaper end, have you had any experience of Des Merrion in Leeds? Or perhaps heard anything about his work? Sartoria Dalcuore and W & S; both very interesting articles. I question, upon reflection, if you can go to Spain and Italy (and India via W & S) might we see a time when you take into consideration the many fine UK tailors at points outside of London. Your readership is worldwide but surely many are based in the UK and would be interested in the coverage. I’m all for casting a wider net but let’s keep it in the round. Re your question from Anonymous above, Des had made me a couple of garments. The quality of his work surpasses anything I have had from the Row, or any of the big name French or Italian tailors often named here. Many have looked at his handwork and been amazed, more so when they hear about his prices. He values fit above everything, but as he does all the work himself, it is a very easy relationship. Give him a try; I don’t imagine your will regret it. One of your best suits in my opinion! Great width and shape of the lapels with a nice roll, and well balanced gorge (don’t you think the “modern” gorge placement is too high?). I also liked the jetted pockets (although I thought you only liked them on tuxes). Bravo! How would you compare W&S to Steven Hitchcock based on style and quality? As has been mentioned, your tie is stunning, but sadly it doesn’t feature in Drakes’ current line up. Any thoughts as to where I might find one? Simon I live in Geneva but get over to London at least once a year – sometimes up to 3 times a year although never with any great predictability. How many fittings would you say one need to work in to have a W&S suit made, and could these be spaced out over a year or so? Thanks Simon. Incidentally, did you get a second (or third) pair of pants made and if so, what was the additional cost? Bravo Simon, you sound extremely pleased with it. This article maybe one of the most significant you have written in terms of opening up bespoke suiting to a market that couldn’t justify the £3k plus cost of a ‘row’ suit, irrespective of relative value. As a more extreme example how does it compare to your C&M and Cifonelli suits: if you say it’s nearly as good that may change everything!! 🙂 Have a good weekend. Thanks for this Simon. In terms of an every day style for work, would you so this would be more suitable than Edward Sexton? That pocket square fold is on point. I mean it’s so majestic, amazing you should do a tutorial on it. This is great to know. Thank you. I might someday soon be able to have a quality bespoke suit as this falls within my budget. Outstanding blog, Simon. After giving myself a headache of what tailor to try next after a poor experience from a new(ish) city tailoring firm (that shall remain nameless), I commissioned a new suit from GB in Dec. I have to say at the first fitting was impressed at the quality / value. I have however been following this W&S post with interest as I use to use Kilgours semi bespoke service 10+ years ago. From the sounds of it you were quite impressed with the offshore made suit. In your opinion is this offering from W&S worth the extra cost over a GB suit ? And would the W&S offshore bespoke offering be vastly different in quality from a from a fully bespoke suit from someone like KH&L? Do you think W&S is better value, better workmanship than Alexandra Wood ( do you know whether AW is bespoke proper, fully canvassed, basted etc ) ? I don’t know her – which says something. And looking at her site, I have my fears – she certainly seems to be a stylist rather than a cutter. Further to previous comment, is it fair to say W&S is something akin to an English Sartoria Vergallo ? Great post Simon, really enjoyed. Wonderful. I have gone for a three piece with extra trousers in the classic bespoke and this makes me feel happy! Gone for a nice navy classic worsted. The extra trousers came in at around £350, I believe (I saw a post below about this). Thanks! I am happy to share my experience/pictures in 4-5 weeks when it is complete, if it is helpful? Have a look at my posts in the past on Rubinacci bespoke. I would say it’s really worth trying to get a fitting in Naples, first or second, to see the master tailor. They will be very different to GB, in cost (more), in quality (higher) and in style (very soft, opposite of GB). It’s unlikely they’ll be able to do it in much of a rush though, given it has to go back to Naples each time to be made. I really like the dramatic asymmetry in your tie knots. However even though we probably buy the same brands (and silks) my four-in-hand tends to come out smaller and less tilted. Care to share your trick? The size is down to the tie – thicker silk or lining for a bigger knot, a wider tie for a longer knot..
as I’ve indicated in my comments on your Vergallo loden coat post, I will also be trying the W&S classic bespoke service for a winter flannel suit. Since you praise John McCabe for his cutting, I was wondering whether needs to be involved in the measurement process and therefore needs to be present during the first appointment? Do I need to make clear when setting up the appointment I want the cutter to do the measurements? Apologies if this is an obvious question. No, it’s a good question. Someone asked that recently on the post announcing their US tour. John doesn’t go on all the trips, but I wouldn’t worry too much about that – as long as he’s there for one or two of the fittings. It’s when the cutter is never present that you really have to worry. The coatmaker, Bob, is also coming on trips that John isn’t. Congrats on the blog. A similar question. Following your review of W&S I have scheduled an appointment for their upcoming visit to NY. I understand none of the cutters will come on this trip but Bob will be present for the initial consultation and measurement. Is sufficient to have the master coatmaker in the fittings or you absolutely need to see the cutter? Quite pleased with my first “classic bespoke” suit from W&S. Fit is very good and I find the level of make and finishing not too far behind my other English bespoke suits. I was able to travel to London to meet Sian for the basted fitting. There were two more fittings in NY with Bob (got the suit at the end of the second one). I liked their house style but it indeed has more drape in the chest than I had experienced in the past. Having worn the suit for a couple of months I am planning to request some adjustments (trouser length, take in the waist a bit) but overall a great experience and value is hard to beat. I will still use my other London tailor but certainly plan to include W&S in the rotation. Thanks!! which is better in your opinion? I am a long time reader of your blog, and I am delighted to say that I am going to be getting my first bespoke suit this fall from W&S based on your review. Since I am attempting to avoid the common pitfalls of my first bespoke suit, I am going to get a mid-grey or charcoal suit that could be a great suit to wear for work throughout the year. I was hoping that you might be able to recommend a particular type of fabric. Thank you for your help and the great website. Thanks for your blog Simon! I’m attracted to the Classic Bespoke offering from W&S for a wedding suit but think I favour two button and slightly stronger shoulders. Do you think W&S would still be a good choice and do you think they would accept these preferences or is their house style quite set? Thanks for your reply Simon. I think I’m inclined to forego my preferences in that case! From what I’ve read on your blog and others, I think W&S are the superior tailor and I’d rather compromise my style and get a better quality suit. I don’t know if that’s the right thing to do but that’s my gut feeling! Thanks for your advice though, it’s useful. Do you recommend against a tuxedo as a first commission from a tailor? Was planning to do so with W&S during their next trunk show. W&S seem to be a interesting chaps.. I have got two questions which I think a lot of people toil with. A.) How do you find out whether a certain off row tailor is really good? (In my case I am interested in Connock & Lockie, Lambs Conduit Street but I am open to other suggestions..). B.) If you decide to trust one and go for it how far can you “impose” your ideas of cut and style on them? Say, could I ask the tailor whether he would be willing or able to make a Huntsman-style jacket – I fear he would feel rather offended..
A) It’s hard, and I think people do and should rely on reviews more for that reason. You’ll find a few reviewed here, most obviously W&S, Graham Browne, Choppin & Lodge, and Manning & Manning. B) I think it’s worth avoiding where possible. They will often try to cater to different styles, but without a lot of experience of doing so. It also depends how close the styles are. A Graham Browne suit and a Huntsman suit are traditional, structured English suits. But different to an A&S drape cut, and very different to anything French or Italian. Wonderful site! I am new to London and to tailored suits and so have been reading your site obsessively. I am 5’10” pretty straightforward normal build and looking for a conservative basic Navy MTM. Today I met with Tim Everest, W&S, C&D, and Gieves & Hawkes. I didn’t think too much of G&W so am taking them out of the running. I note your enthusiasm for W&S. How would you compare them to Tim Everest or C&D for MTM in terms of quality and value? Tim Everest offered a 10/11oz super 120 fabric for £1450+VAT with full canvas and extra trousers done in six weeks at a factory in Czech. W&S was at about the same price point without the extra trousers for a super 100 9/10 oz made in seven weeks in India. I can’t afford full Savile Row or top Neapolitan prices for my bespoke fetish, so I first read this review with great interest. As a far-flung western Canadian from the provinces, I’m not at all put off by the cheaper W & S option of having the finishing done in fellow former Commonwealth colony India; on the contrary, especially with their dedication to good training, ‘fair trade’, good wages, etc, I find this option not only economically attractive but also ethically admirable. Eventually, in a visit to London last summer, I had W & S make me a versatile grey flannel three-piece and I was extremely pleased: absolutely wonderful cut and fit, and exquisite hand finishing. Next, however, I ran the risk– despite your seemingly strong opinion against drawing a tailor away from his ‘natural’ house style, Simon– of asking Suresh to make me an even softer, more Neapolitan style sports jacket. The fact is that I haven’t had the fortune to connect with any Neapolitan tailors like I have a couple in London, so I asked Suresh what they were comfortable with. Insisting on something still identifiable as W & S, bearing Bob and John’s beautiful fingerprints but of much softer construction, I was reassured with confidence by Suresh. I chose the Holland and Sherry 892004 slate blue Harris tweed and plunged in. I must say that I sincerely couldn’t be more pleased. The jacket they’ve made me has jumped immediately into top place as both my best fitting AND most casually comfortable piece of clothing: the shoulders are just what I wanted, even softer (much softer) than in the suit jacket; there remains, despite the soft structure, a bit of English drape that I love in the chest; and really it’s the waist that is absolutely sublime– a perfect pinch, fitting me so well between the arm holes and waist; most of all, the skirt is truly the most beautiful I’ve worn in a jacket, with even the snifter-shaped patch pockets perfectly proportioned for its exquisite lines. Although I agree, Simon, about expecting no artists or artisans, tailors or otherwise, to takes ‘bribes’ that stretch their natural styles beyond zones of comfort/ experience— but with W & S I clearly wasn’t asking too much. I hope someday to access (and afford) some ‘pure’ Neapolitan tailoring— but in our globalized world, even from a post-modern perspective— ‘purity’ is a questionable concept regardless. Thanks Jon, very interesting to hear. Hi Simon. I’m thinking very seriously about commissioning a suit from W&S, using their Classic Bespoke service. I wonder if you could tell me, from your experience, about the rough timeframe of this process. i.e. how many weeks from measuring to first fitting, from first fitting to second fitting, etc. Also, is their normally a third fitting?. Thanks very much. The timeline is very similar to other bespoke offerings – usually 4-6 weeks between each stage, often quicker towards the end. There isn’t necessarily a third fitting, but there will usually be one or two small things that it’s worth refining if it’s your first suit. Another question Simon. One of the reasons rate Whitcomb is the presence of cutter John McCabe. I notice that they have recently taken on a new cutter called Sian Walton. Do you know anything about her? Thank you very much for all your great advice! Not for anything approaching a Neapolitan cut Stuart, no. Great thank you very much! And in your opinion would a soft jacket from W&S be suitable to wear with relaxed chinos and jeans? Would you say W&S would be a sound option for someone’s first bespoke suit and if so, any advice on a maiden voyage such as this? With the W&S being a better product? knowing that W&S now have two cutters would it be wrong to ask for sian walton to cut more in the Thom Sweeney style ? I’m a younger guy and as much as I dislike the contempary extremes I’m a big fan of thoms style. sorry if its a silly question. No it’s certainly worth asking, but do try to be specific in what you would like. And I would also sound a general warning that getting a satisfying result when asking a cutter to do a different style than what they’re used to is very hard. So be prepared that it’s a risk. Following on from my previous questions, I would just like to say that I commissioned a Classic Bespoke Suit from W&S for my wedding day, cut by Sian in a dark navy Holland and Sherry 9 1/2oz Mohair. Couldn’t have been more pleased with it! Desperate to find an occasion to wear it again! After much internet research and reading your recommendation I have taken the plunge with W&S. Classic bespoke, single breast in Minnis grey wool cloth 12/13oz. Great service and advice. Now looking forward to first fitting in 6-7 weeks. Really great blog. Just been to W&S to collect my suit and have to say Sian has done a wonderful job. I hope you do not mind me mentioning, but I noticed that you also have a new piece in work with them and that it has been made in a toile initially. This is the process by which my suit was also made. The results are great and I would very much enjoy hearing how your experience is. Really pleased although I think there might be some mistake – I don’t have a fitting in a toile. I have a coat in a pale wool that perhaps could have looked like a toile? How strange, and to deepen the mystery further it was a pair of trousers which I had seen. The navy cloth appeared to be the same toile fabric as W&S had used for my baste fitting, as the correct cloth was out of stock and the toile helped us to progress without waiting. I am no expert in cloth so I can very easily have been mistaken and, of course, you know better than I what you have being made. I look forward to reading about your experience in the near future. My experience not so good. Very good sales and marketing. Important stitching unfinished and then came undone. Fit not good. That’s really interesting to hear. Could you give more information on the stitching point and the fit? Thank you, Simon, for your evaluation of this bespoke option from W&S. Your comments in the discussion are helpful in triangulating their merits. I also found the comments of others instructive and food for thought. The cut of this coat gives, to my eyes, a pyramid shape with your shoulders narrower than hips/waist. Is that a consequence of your intentions or is it more John McCabe’s style of cutting? I noticed that the Saman Emel jacket (22 January 2018) gives more prominence to your shoulders and to my eyes, a more balanced presentation. 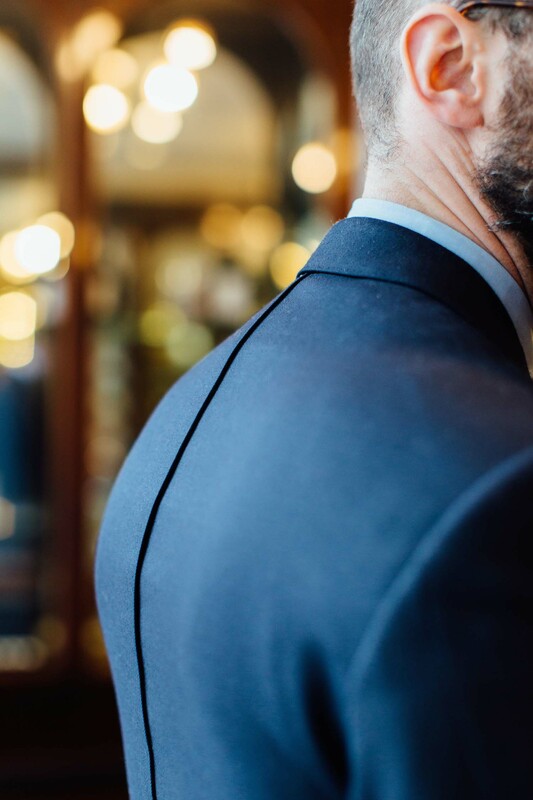 Whilst acknowledging that the intent of any bespoke tailoring is to enhance and flatter the wearer, I would be interested to read more about the ‘tricks of the trade’ used to mitigate different physical challenges. In my case, a long body and short legs! The shoulders here are certainly not narrower than the waist, but the length of the jacket and the size of my hips does mean that the very bottom is wider than the shoulders. That’s largely due to length of the jacket, and a slightly fuller skirt. Hi Simon. Thanks for all the informative articles. I am planning to order my first bespoke suit soon. After reading your reviews, I am definitely considering the W&S Classic Bespoke offering. But as I live in Geneva, and Varese would not be such a long drive from here, would Sartoria Vergallo also be a great option for high-end bespoke at relatively good prices? Or are they at a much higher price point than W&S? Could you also compare the house styles of both tailors? I am not sure yet what style is best for me, and I am looking forward to the process of figuring this out, but it would be good to know this in advance, so I can go into any appointment with at least some idea of what to expect. 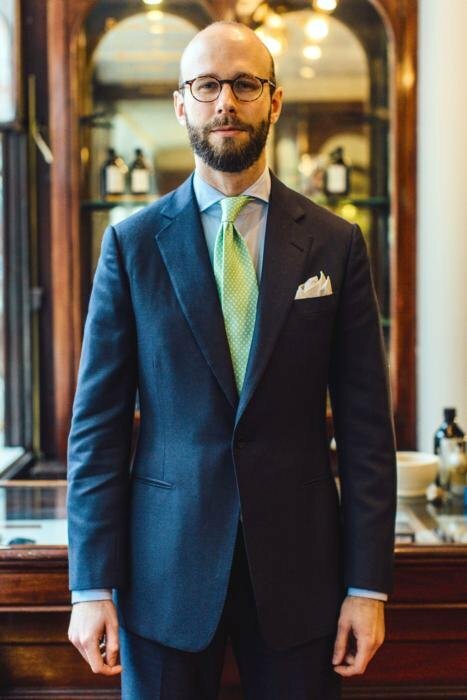 Are there any other tailors in the Milan/Northern Italy area that I should consider as well, that would be great starting points to the high-end bespoke world? Looking forward to know your thoughts. Thank you in advance. Hi Simon. Thanks for your reply. Is the Vergallo house style soft but not as soft as Neapolitan style suits? So it would still look a little more formal than the Neapolitan style? I want to have a morning suit made. I initially thought I would go for A&S as I love the style and think they would guide me through the process extremely well. I worry, however, that they might be a bit expensive. Would W&S be a good option. They seem stylistically similar (soft w some drape), and affordable. I just wonder if for something traditional and rarer like morning dress they would be able to help guide me through the process as well as A&S. I wouldn’t worry as regards experience – John and Bob (coatmaker) have plenty of experience there. Thanks simon. As ever a brief article on this subject would be highly appreciated! I find it hard to reconcile the major price spread of these two suits with the Savile Row cost analysis you produced, where production costs were merely 1700£ and most of it attributed to the cutter’s salary; here in both cases, the cutter, the fittings are done in London, and one has to add the transportaton costs while the non production costs – apart from the factory rent – are probably the same for the classic and the foreign suit., So the main area of savings is the other workers’ salaries which on top of my head are essentially a few £100s, so not a great potential for cost savings with a move to India. 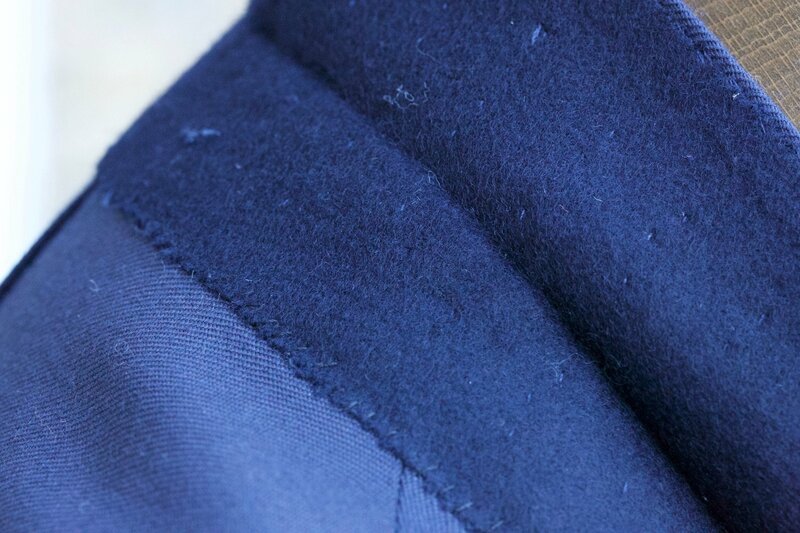 This Navy suit is exactly what I imagine I’d have for my first bespoke, but I don’t understand about this lap seam at the back? 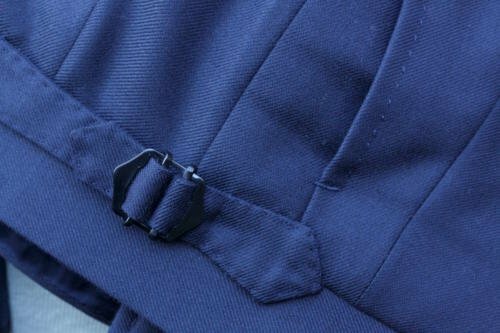 And what determines if one should have flap pockets, ticket pocket and turn ups on trousers or not? I really like how the waist is just a pitch slimming/tapered but not too slim like most “fashionable” suits out there now, almost uncomfortable to see let alone to wear. By the way, do you know what’s the price at W&S for a Classic Bespoke tweed jacket? And a pair of flannel trousers? Would you recommend high rise or mid rise? The lap seam is very much a bit of style flair and is probably worth doing without on your first suit. On the style questions, eg pockets, have you looked through the Suit Style series of posts? I like the lap seem as an added detail to subtly highlight the craftsmanship and wonder whether this would be acceptable on a double breasted suit? I am debating a single or double breasted suit in dark navy for my wedding. I’m looking forward to commissioning a suit for my wedding next March. I particularly like the drama of Edward Sexton cuts in subtle fabrics, similar to your grey flannel suit. Ultimately, the tailor will be chosen to suit my budget. This makes Whitcomb & Shaftesbury’s classic bespoke service most likely, though Sexton’s offshore bespoke service might also be an option. With this in mind, what difference (if any) would there be between a suit cut by a cutter who specialises in a particular house cut, and a cutter who deals with a wider range of styles? I’d always recommend that you stick to a tailor’s house style as much as possible. Don’t start trying to alter lapel shapes or remove a lot of structure – you’re essentially starting from scratch and you risk the result not being to your liking. So I would go to Sexton for their style, and to Whitcomb for theirs. Whitcomb might have a slightly greater range in style than Sexton, but not much. If you’ve seen an example you like from either, however, then go for it. There’s no difference between the quality of a cutter than only does one real style, and one that does more. Thanks, Simon. That’s very useful. So the variation in style is house to house, rather than cutter to cutter. That makes more sense. Simon – are you familiar with Redmayne 1860’s MTM service and, if so, between Redmayne’s “1860 Acclaim” MTM and W&S classic bespoke, which would be better quality? 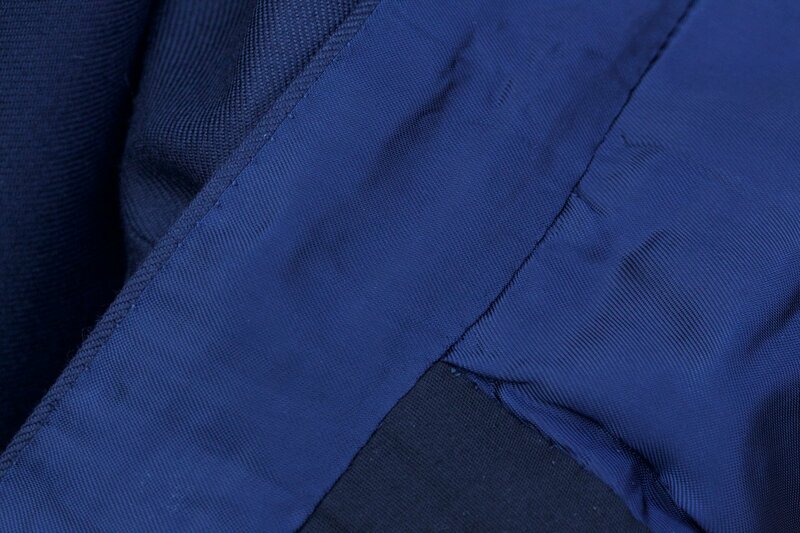 Hi Simon, quick follow up on the cloth and finding the right shade of navy for business. From the H&S Classic Worsteds bunch do recall if this was the navy, dark navy or midnight? One of the things you commonly say is not to change house style too much as there is a risk it might not turn out as expected, based on cutter experience, etc. However, how far does that extend to? For example, can the lapel width (not shape necessarily) be extended slightly? I am considering a suit commission using W&S and I personally like a wider lapel as it looks better for my body type (proportionally larger chest and smaller waist). Curious on the lapel width used here. I would estimate 9cm but if you get a chance to measure it I would be grateful. In terms of house styling, who would you compare W&S to? It looks a bit like Anderson & Sheppard and Dege & Skinner. Having few things made by by Whitcomb now, would you recommend them for a first bespoke suit ? I am split between Graham Browne and Whitcomb. The prices are comparable. It does not matter if WS are getting some part of the work done in India, the suit looks fantastic in the photos. To be honest I am leaning more towards WS now but cannot make up my mind! possibly a slightly unusual choice I’d like you to ask about, purely subjective of course: for a first bespoke commission, if your budget was a tad higher then W&S classic – say 2000£-3000£ – would you still choose them (and add an extra trouser to get to 2k+) or go with one of the cheaper Italian tailors, say Vergallo or Solito, (at around 2200 – 2500£) or give a young / next generation Saville Row cutter a chance (e.g. Jennie Adamson et al. – around 3000£ but entirely made by them)? I understand there a differences in style obviously. I’m more interested in the actual craft. P.S. I’m also based at Mortimer House, on the 6th floor. Will introduce myself soon when I see you around. Purely on craft, yes I’d choose someone like Jennie. But as you say, the biggest differences between all those are style. Nice, look forward to meeting you! Apologies if I’ve missed it somewhere but what is the lapel width here? Really like the balance and proportions of this particular suit, perhaps it would be worthy of a style breakdown sometime? Yes Stuart, I’ll certainly do one. Just focusing on the big-name tailors and dominant styles to start with. How does their house style translate to a relatively casual sports coat (like a tweed jacket with some casual detailing that could be worn down with denim, or up for the office with flannel)? If done as a sports coat, would you consider it too structured/formal to wear tieless? It seems to have a bit of drape, and the shoulders aren’t too “military”? Hi Simon, how does this “classic bespoke” service compare to Savile Row on after-sales servicing? Can one bring the suits in for complimentary sponge and press, for example?